Crafty Tidbits: Owl's Things with You? Our craft group met on Saturday. We can't really say "crop" anymore, because we're all into sewing now! Blame it on the Great British Sewing Bee, I guess! Whatever the reason, we're all thoroughly enjoying this new twist. 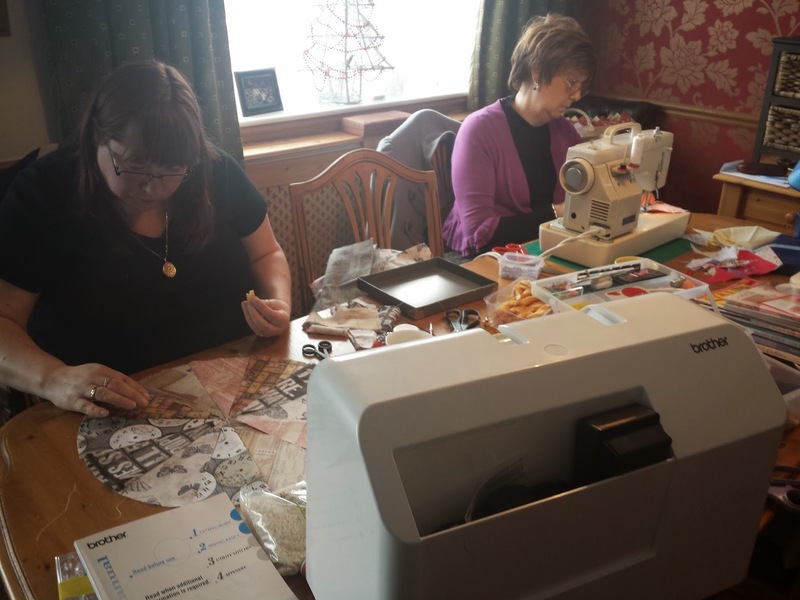 On Saturday, each of us brought a sewing machine, so there were six of us going! What fun! It did get a bit noisy but we didn't mind. We've gone from scrapbooking to cardmaking to Project Life to beading to knitting and now sewing. That's my machine in the foreground, or rather its case. I'd already finished at this point and Barbara had moved her machine temporarily. Andrea's and Hazel's machines aren't in this picture. Everyone said they're having lots of fun rediscovering the joy of sewing. I highly recommend it! Our group has been meeting for the last eight years (!!) and we really look forward to getting together once each month to catch up on news, encourage each other's craft efforts, share patterns and tools and expertise, and of course share the all important cups of tea/coffee and pieces of cake or something similar. 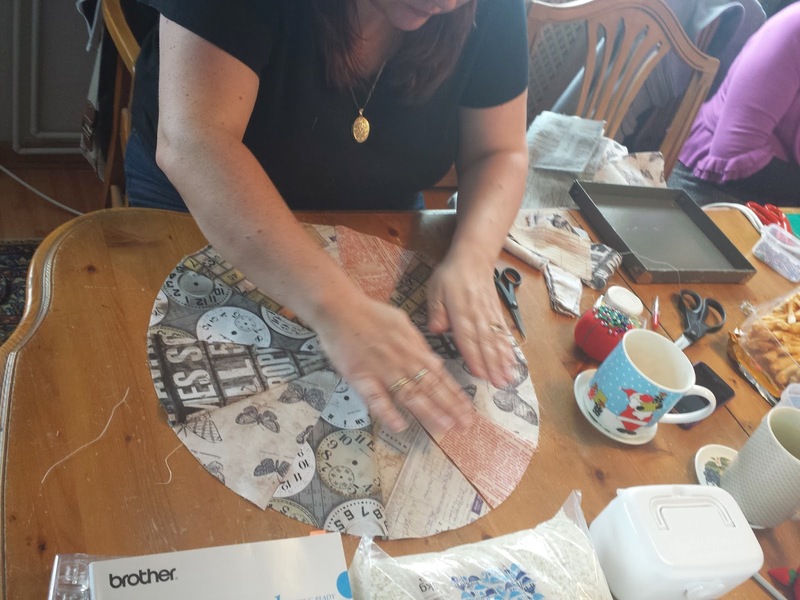 Barbara was making a round cushion. 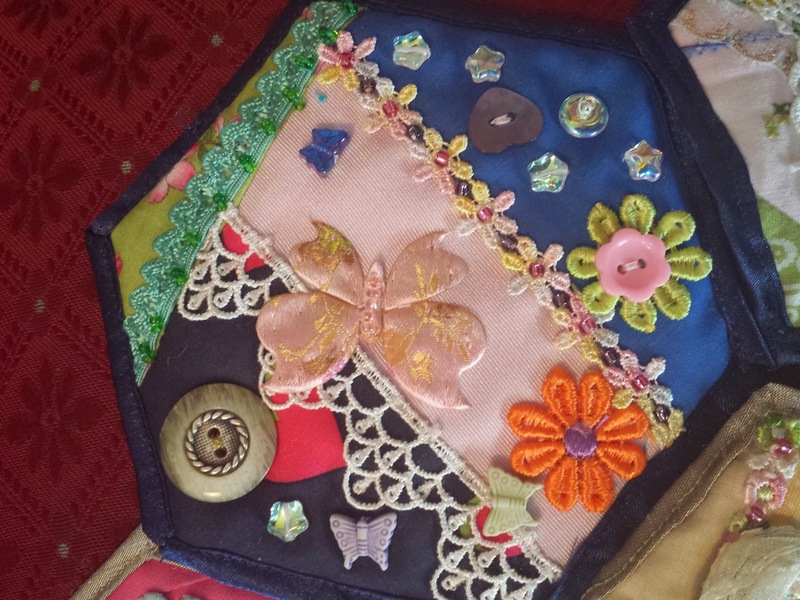 Diane was working on a pincushion which would be similar in style to Barbara's cushion, but on a smaller scale of course. Andrea was making a patchwork jewelry (yes, that's the American spelling of "jewelry") case and Hazel was working on a small quilt. 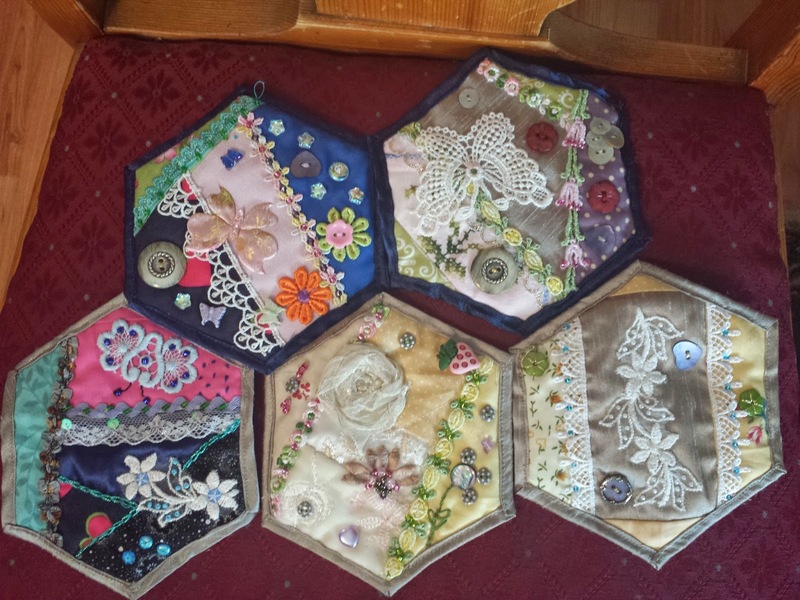 Hazel had some stunning hexagons that she'd embellished with scraps of lace, ribbon, and doo-dads. How beautiful are these?! I'm afraid I don't have the time or patience for these, although Hazel says they're really quite quick to do. She used some beautiful dark blue silk. She really did a beautiful job on these and used all sorts of odds and ends from her left overs. And what did I make? 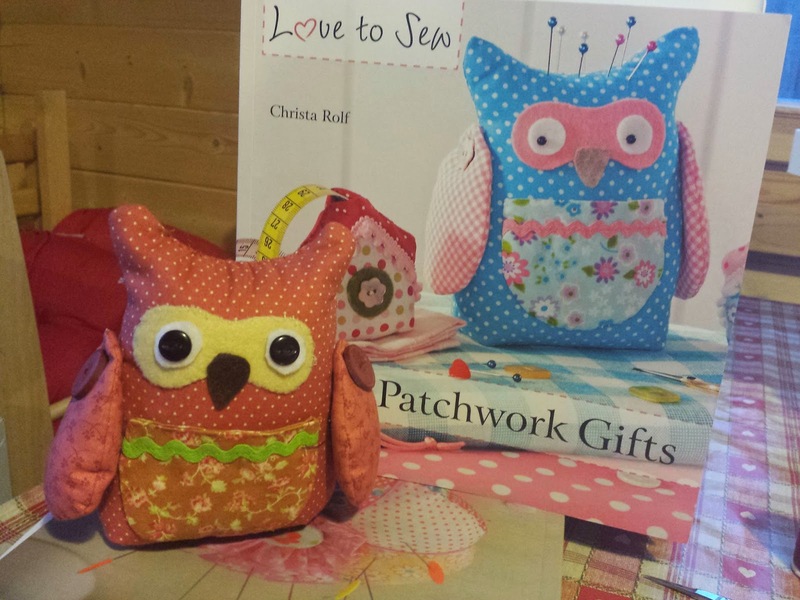 A precious little owl pincushion from the book, Simple Patchwork Gifts by Christa Rolf. I have a couple of her other books, too, and love them. She provides the patterns and easy-to-follow instructions for each project. The lighting on this owl makes it look very yellow in the photo. It's actually got no yellow at all, however. The felt piece on the eye area is actually off-white. We just returned from a short break to Bournemouth and I found a shop called Fabricland. Oh my.... I thought I'd died and gone to heaven. Hundreds of rolls of fabric - all sorts - and inexpensive. I bought several pieces for clothes and for more "projects" like bags, aprons, etc. So now I'm off and running! Oh please don't mention the sewing bee. I watched it and now I think I can hear my sewing machine whispering my name. Great colourful creations, looks like fun. What an interesting collection of items.. how lovely to have such a regular group to share ideas/stories thoughts with.. keep going!